This family was suffering from continual water issues, and Waterguard was an excellent solution to their headaches. Customer noticed seepage in finished lower level of home. We decided to run waterguard, add a sump, and install an underground downspout to solve her problems. I just put this property under contract and had an inspector out. They recommended I have the foundation looked at, along with any structural issues with the foundation. There is some settling occurring and I'm curious as to how much more it may or may not settle and what I may or may not have to do to preserve the property. Insulting crawl space. +/-150sqft area. My basement leaks, I need a new sump pump, and I believe I have mold. We have a foundation that needs structural repair as part of a real estate transaction and need a estimate and quote ASAP. I have a crack that needs fixed. "The crew paid great attention to detail." "Pleased with everything so far! I had great service from Niles and then the installation crew." "I appreciate the company and the service they provided." "It was a pleasant experience, an excellent company with wonderful and friendly workers." " We were very happy all the way around, from the initial phone call, Niles quoting, and the service provided on 7/3 and 7/17. They were courteous, professional, and helpful. " "The presentation that Mike provided was impressive and professional." "It was so nice to deal with a company that is trustworthy." No nonsense, no hard sell, great job at a fair price. "Very satisified with entire process." "Our unit was just installed and and we already are noticing a difference!" "I was impressed by your friendly, efficient employees! Thank you for all your help." The job was well done, and I have told people I know that if they know of anyone with foundation leaks, they should contact your company! "Everything went very well. I appreciate all of the advice." "Two of the companies I called were way over the top in what they were going to charge. Another was going to do major damage to the dry wall and horizontal studs." " In my case, the work went beyond expectations. " "I am very happy with all the personnel from Nova." At Nova Basement Systems we put customer service first and are proud to serve our area. Our team of trained technicians use only high quality materials from the best manufacturers in the business to ensure that you get only the best results. If you have problems with your basement's waterproofing, the solution might be easier than you think. 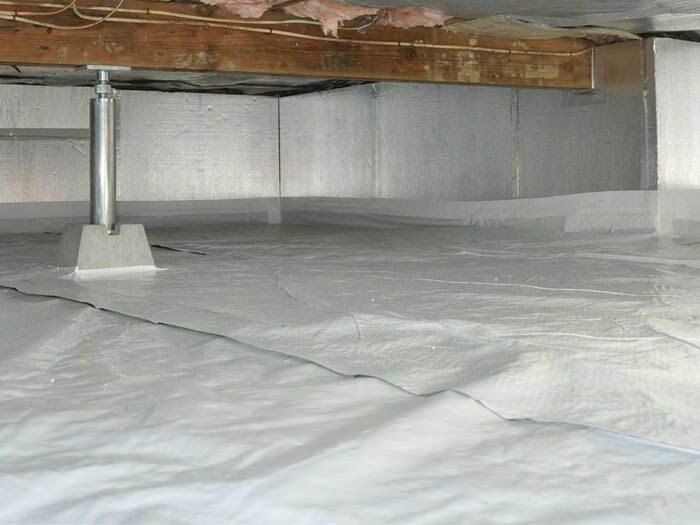 With our waterproofing system, we can turn wet, damp, or even flooded basements into dry, clean, healthy spaces. The longer you wait, the worse the problem will get, so call in the professionals at Nova Basement Systems to help you get back to enjoying your basement! We can install the uniquely designed TripleSafe sump pump which is equipped with a primary and secondary pump, as well as a third, battery operated backup pump. Trust your basement to the professionals at Nova Basement Systems to get your project done right! Crawl spaces are one of the areas of the home that can fall into disrepair more easily, often simply because of their location in the home. If your crawl space suffers from mold damage, debris buildup , or even pest infestations, then you need the local professionals of Nova Basement Systems. We can install our crawl space encapsulation system which will not only reduce the amount of mold, mildew, and water damage in your crawl space, but also improve the air quality and overall health of your home. Think you might have wood rot or mold damage? Don't wait until its too late and have it inspected by a specialist. Small repairs can turn into large, expensive projects if left unchecked so it's important to keep mold growth and wood rot in check. Issues with foundations often seem like a bigger, more complicated problem than most of them actually are. For a lot of foundation problems, the cause is simply weakened, broken soil that can no longer support the structure. To fix this, we offer a variety of solutions like wall anchor systems to correct bowing, leaning walls, and epoxy crack injections to repair cracks in walls or floors. Nova Basement Systems has the experience serving our area needed to get your project done right the first time. Our team of friendly, knowledgeable staff and professional technicians want to put their expertise to work for you to find a solution that will best fit your home and your budget. Call us today for a free estimate! Foundation issues need to be investigated. Ceiling and Walls in the basement are buckling. Cracks present in main level bedrooms. Dirty crawl space with old insulation. I need it cleaned and new insulation installed. Possibly have it encapsulated and add dehumidifier. We have a old historic building with a wet basement and musty smell in the house. Orders lingering after water pipe break. Water is leaking in my basement from a wall that i cant trace and water is also appearing in middle of floor in basement and no visible crack n concrete...i wld like a quote to see what the cost will b to fix. Two cracks in basement walls need to be filled due to water seeping in. Leaking basement in northwest corner of basement and along west wall. Also visible cracks in foundation. The basement is cinder-block, not a poured basement. I need to get an estimate in hand by the 23rd of July. I currently have in the open-air crawl space area under half of my home. During this warm-weather the crawl space is condensating so much that there is liquid dripping off of the floor boards. The insulation that is suspended between the floor joist is getting so wet it is falling out of the gap.